LINK Upper Clutha is the central government-supported, locally-driven community development scheme that is working to connect our community as it grows. The United Nations defines community development as “A process where community members come together to take collective action and generate solutions to common problems.” Community wellbeing (economic, social, environmental, and cultural) often evolves from this grassroots action. New Zealand is investing in regions that are ready to energise their efforts. The Alpine Community Development Trust won a three-year grant from the Department of Internal Affairs to fund a Community Development Scheme for the Upper Clutha. We are one of twelve regions awarded the grant in the 2016-2018 cycle, which will fund coordination and execution of a community development plan. Wanaka is at a crucial point in our development, needing to build a strategic, coordinated community infrastructure to accommodate our high growth rate and future-proof our success as a region. More and more people are flocking here, with growth being both our opportunity and our challenge. Opportunity because more people in the Upper Clutha bring money to fuel the economy, innovative ideas to inspire, and children to be nurtured and grown in our local paradise. Challenge because all those people need places to live, jobs, schools, health care, and ways to enjoy our spectacular environment without destroying its beauty. The Local Government Reform Act of 2012 eliminated councils’ responsibility for community wellbeing. This has resulted in decentralisation and absence of responsibility for the heart and mind of our community. There are many talented people who are passionate about picking up where local government left off, but the organisations they create to do good are sometimes uncoordinated, siloed, and replicate effort. Multiple organisations with similar goals often tap the same talent and funding pools. Community wellbeing can’t happen without an effective infrastructure that supports that growth. The Community Development Scheme allows us to work with leaders across community sectors to build unexpected partnerships and produce innovative solutions that make the most of our strengths. ACDT provides governance for LINK Upper Clutha. ACDT also operates Community Networks Wanaka, our region’s social service hub. Establish LINK governance, structure, and objectives – recruited a steering group of diverse community leaders; developed a name, mission, vision, values for the initiative; established governance through the Alpine Community Development Trust, including policies, procedures terms of reference; developed a communication plan; recruited staff (Facilitator and Coordinator); agreed financial plan for the three years of the DIA funding. Asset mapping – four-month long exercise to identify and catalogue our region’s community groups, economic, and physical assets. Built relationships with key stakeholders – Wanaka Community Board, QLDC, Chamber of Commerce, the Centre for Unique Business Evolution (CUBE), Lake Wanaka Tourism, Community Networks Wanaka. Developed a communication and engagement plan to gather community feedback to direct the work in Year 2. Conducted best practice research in community development around the world – in order to help us understand what’s possible here in Wanaka. After the foundation setting of 2016, LINK established regular community communication channels (website and Facebook page to centralise resources and enable online interaction; monthly email newsletter) and focused on meaningful engagement of Upper Clutha residents in the growth conversation. In order to be community-led, LINK spent several months listening to the people of the Upper Clutha, through our quick input mechanism of the 3 Questions survey, in-depth interviews with community leaders, informal interactions, and group discussions. The survey asked, 1) What do you love about your community? 2) What could be even better? 3) How could you help? These questions were asked in person, on paper, and online. The goal was to “go wide” and hear from as many people as possible, providing the opportunity for engagement to all. We now have over 650 responses in our database. The full report can be found on our website. We shared this data widely – in the media, with participants, with community organisations who have used the data to inform their own strategic planning and understanding of community sentiment. Key Observations: The things people value about our place are the beautiful environment we live in and the supportive, friendly and close-knit community. For many the environment is what first draws us to Wanaka but it’s the people and the community that make us want to stay. There is a unique vibe that people want to preserve. However the data indicate a rising level of concern that the things we value so dearly are slipping away as we grow. Wanaka is no longer a town where you know everyone at the supermarket. People want to see better planning and management of growth, with attention to infrastructure issues like parking and transport. Respondents seek a more connected and supported community, and are seriously worried about affordability. Community collaboration incubator – support community groups in their creation, development, or evolution – strategic planning, marketing support, grant information, recruitment, etc. Used asset map to provide information and connection resources. Plan to offer financial support through LINK Community Fund in 2018. We have created a variety of communication and engagement channels, including the popular Connection Cafes. These are monthly drop-in networking session where attendees can meet others, tap into our community database, and ask the LINK team about turning ideas into action. With different topics, these draw a mix of community members plus the “regulars” who enjoy the networking. Councillors and Community Board members attend as well. These have highlighted the amazing energy that comes from collaboration – the ideas and connections happening real time are quite exciting! Aspiring College Life Skills course – “Citizenship and Community Belonging” – LINK was invited to develop and teach a module of the year-long Year 11 Life Skills course, which has been a wonderful opportunity to connect directly with youth who can help shape the future of our place. Intergenerational connection – an area of longtime interest, LINK was able to bring together a group of young mums, the local Plunket committee, and our retirement communities to explore possible ways they could build relationships. As a result, two of our retirement homes now host morning teas/playgroups with parents and their toddlers! A great example of cross-segment connection that reduces isolation and builds a more connected community. Responding to energy in the emerging social enterprise space, LINK has hosted national foundation Akina for an awareness raising workshop, and subsequently has been involved in an ongoing district-wide network of leaders helping build this economic sector. This is an example of identifying a desire for connection and learning and then partnering across community and geographic segments to provide support for social entrepreneurs. 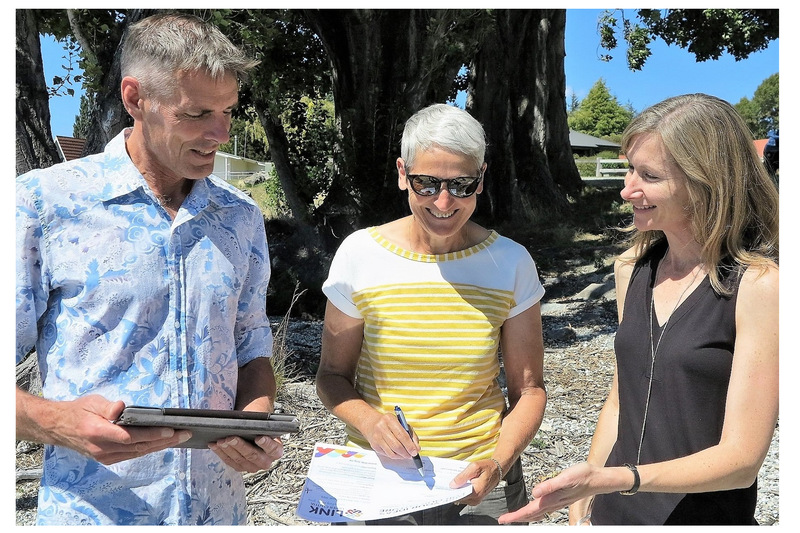 We have worked with community leaders to reflect community input in decision making – eg, submitting on the 2017-18 QLDC Annual Plan, presenting the data to Lake Wanaka Tourism, Wanaka Chamber of Commerce, Alpine Community Development Trust, etc. 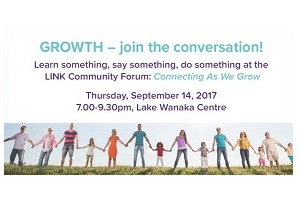 A major project was the LINK Community Growth Forum, co-hosted with the Wanaka Community Board. Connecting As We Grow was a massive event held September 14, 2017 with the intention to “learn something, say something, do something”. Nearly 300 people attended the evening, which shared information in order to understand the current state of long term planning, tourism, our economy, and existing community-led projects; and hosted an interactive expo where attendees could interact with community leaders and groups, giving input or pitching new ideas. Our website provides a full recap, photos, and videos from the night here. We shared 3Q data with QLDC Community & Services Committee and offered to discuss best practice community development – in order to share our learning district-wide. Progress! On all fronts. We have achieved quite a lot this year and gained momentum as a valuable, free community resource. Met and exceeded our DIA workplan goals. We have established LINK as a key community organisation working with and across the entire community. Other entities look to us for direction and input. The LINK 3 Questions Community Campaign and key stakeholder interviews created a rich understanding of our community’s thoughts, feelings, and capability to plan for our future. By creating this databank and sharing it widely, local government and other key stakeholders are better informed about community energy and priorities. As LINK has found ways to contribute to community building, we have seen an increased level of positive energy and hopefulness about using community strengths to effect change. Launched the LINK Community Fund, an effort to support grassroots, community-building initiatives with financial support along with mentoring. 18 applications were received, 10 were awarded funds. DIA provided seed funding for this project, with top ups from local funders. Collaboration and volunteer effort were key criteria. Invited back for a second year of teaching the LINK-developed Life Skills class, “Citizenship and Community Belonging” at Mt. Aspiring College. Very engaged and positive response from students and teachers. Major community skill-building event planned for June 20-21, 2018 – Get Dotted! At these workshops, attendees will gain an understanding of their own and other’s communication styles, learn to work from their natural strengths, and take away tips for more effective communication and collaboration with others. These are key skills our community members need to develop effective relationships and plan for the future.